In late February, during the second game of the 2013 women’s lacrosse season, the Huskies were behind 8-7 in the second half against No. 15 Boston College, when freshman Carly Palmucci ’16 (CLAS) scored what would be the third of her four goals that day. The Huskies went on to score six unanswered goals to earn a 13-8 win for their second win of the young lacrosse season. Now with a 5-0 record heading into Saturday’s 1 p.m. game against Binghamton at the Sherman Family Sports Complex, the Huskies have returned to the national rankings this week for the first time since 2007 with a No. 20 ranking in the deBeer Women’s Media Poll. They are one of five Big East teams ranked. A national ranking is something new for this lacrosse team, including head coach Katie Woods, one of UConn’s youngest head coaches, now in her third season at Storrs. Lewis says with the stability provided by Woods over the past two seasons, the team knows the expectations of their coach. Woods, an All-American on the field and in the classroom when she played at Drew University, has a master’s degree in sports psychology. She says she still considers herself a student of her game, with a particular focus on the mental aspect of sports. 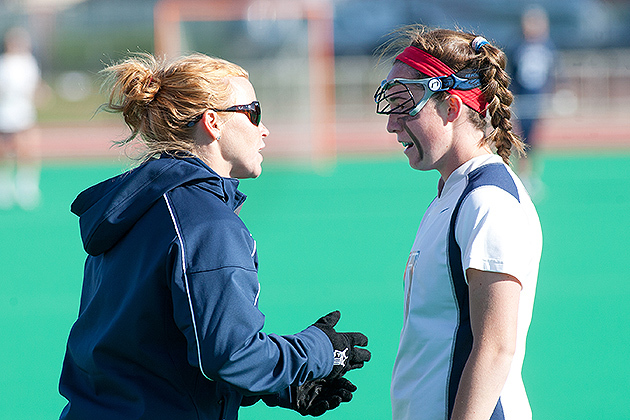 She says that she tries to learn from her coaching colleagues at UConn and in lacrosse. 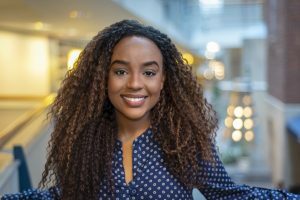 She also reads a variety of books, both in and out of sports, to gather new ideas, including works by business consultant Jon Gordon, whose writing on leadership has been used by professional sports teams. “I look to a lot of different writers, people that deal with the business world or other areas, to give me different ideas or a fresh piece of advice that I can use with the team,” she says, noting that her current “homework” is reading 10 Minute Toughness by best-selling author Jason Selk, one of the nation’s premier performance coaches. Her office bookshelf also contains two books by Hall of Fame Basketball coaches, A Game Plan for Life by the legendary UCLA basketball coach John Wooden and Geno: In Pursuit of Perfection by UConn women’s head basketball coach Geno Auriemma. Lewis says Woods’ approach with the Huskies has transformed the team significantly. 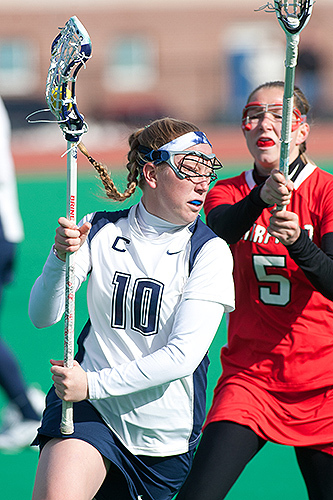 The power in the Huskies’ offense is led by junior midfielder Lauren Kahn ’14 (CLAS), who has scored 14 goals and provided 12 assists for 26 points and was named Offensive Player of the Week in the Big East for two consecutive weeks recently. 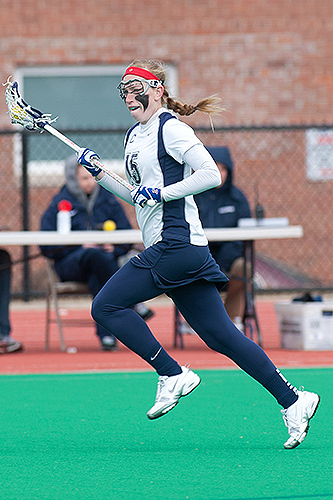 Junior midfielder Kacey Pippitt ’14 (CLAS) is second in scoring, with 13 points from 12 goals and an assist. Freshman goalkeeper Shannon Nee ’16 (CLAS) has spent the most time guarding the net and has won four games, sharing duties with sophomore Marya Fatoni ’15 (CLAS), who has earned one win. Woods says the group of 13 seniors on the team have supported their younger teammates and allowed them to gain confidence as they moved through the early part of the schedule. She says the senior leadership also has helped to steady the younger players during a game, particularly on the defensive side. Lewis, Mackenzie Rainone ’13 (CLAS), Kelsi Tucci ’13 (CLAS), and Siobhan Wilcox ’13 (Nursing) serve as the core of the Husky defensive unit. 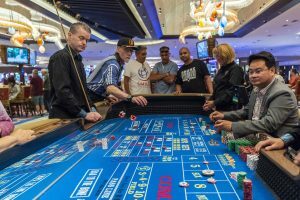 With a higher national profile for the team and Kahn’s scoring ability sure to be the focus of opposing teams, Woods says the balance of the Huskies’ offense will help keep the team moving forward. Lewis says while the team’s national ranking is still new and word is getting around on campus, the members of the lacrosse team recognize they cannot rest on their ranking.